The second Thursday of October each year is dedicated to raising global awareness about the problems of blindness, visual impairment and the rehabilitation of the visually impaired. This year, October 11 is World Sight Day. While the facts seem alarming, it is important to know that 80 percent of blindness can be prevented or treated. At Sightsavers, we work with over 100 partner organisations across 17 states in India to ensure eye care and blindness are considered in a holistic manner. Our programmes are designed to work with communities at the local level to create awareness of eye conditions and their prevention. We also work to strengthen existing health systems wherever possible and seek to influence governments through advocacy and by demonstrating best practices. Sightsavers’ work in India, which started in 1966, has supported the treatment of over 36 million people with eye disorders and brought eye services to some of the least served areas of the country. We, along with our partners, work in 17 states across the country enabling quality eye care to the underprivileged population. Many who have been reached on time have had their sight restored. Take for example, Daniel Fonseca, who runs a PCO in Mankhurd, Mumbai. He has an impairment in his lower limbs which allows him to move about only in a wheelchair and tricycle. When Daniel’s vision started to blur, life became more challenging than before. He was aware of the vision centre that operates near his home in Trombay, run by the Mumbai Eye Care Campaign (a Sightsavers initiative). On getting his eyes checked, he got to know that he had cataract which was causing the blurriness.After a successful surgery at the referral hospital, he regained his eyesight and is now back at work just as before. He wears spectacles which were also facilitated by the vision centre. Vision centres are a crucial element in the programme providing basic eye care to the underprivileged communities living in the slums of Mumbai. Fifteen such centres have to date screened over 700,000 people for eye conditions. Venkatesh, an 8-year-old who studies in the third standard of the Government School in Bangalore, had trouble reading and writing in school. He could only see large, printed letters and also suffered from constant headaches. During NannaKannu’s (‘My eyes’ in Kannada) school screening programme – run by Sankara Eye Hospital in partnership with Sightsavers – Venkatesh’s eye condition was diagnosed as high refractive error in one eye. 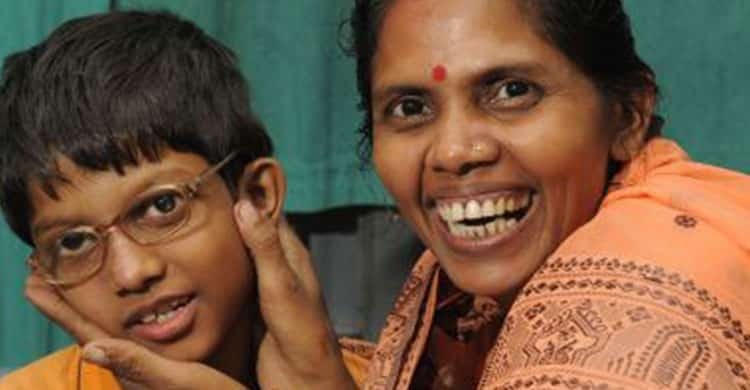 The Hospital treated him and prescribed spectacles after which Venkatesh’s vision has improved. The headaches that he used to suffer from have now almost gone away. Today, Venkatesh is a happier and more confident child who wants to pursue his studies and grow up to become an engineer. NannaKannu has reached out with basic eye care to over 17,000 school children in Karnataka. Then there is Maniki Patro, who lives with her daughter in a small thatched house in a village in Gajapati district of Odisha. She was suffering from cataract for almost ten years and was not able to see at all. Lack of awareness that her eye condition was an easily treatable one forced her to continue being blind. Maniki was continuously dependent on her family members to even complete small, day to day tasks. She then came in contact with Sightsavers supported partner, Centre for Community Development, who directed her to the local district hospital. The cataract in her eyes was removed through a simple surgical procedure. She is now back at home with her sight restored and is able to get involved in regular household activities. In each case like that of Daniel, Venkatesh and Maniki, we, at Sightsavers and our partners have reached out to people in the least served areas of the country. Maintaining quality standards and using the best processes possible has ensured a high level of eye care to underprivileged people.The joy they experience, young or old, at being able to see again is something I can never forget, having witnessed it time and again.